Well, it is time for many of our seasonal operations to open over the next few weeks so I have been running in circles on business issues. Also, I must confess that blogging is becoming a sort of Groundhog Day (the movie) experience, with the same arguments circling over and over. How many more times can I write, say, a long article about how minimum wage increases are a terrible anti-poverty program only to get one line emails asking me why I hate poor people. So blogging will be light as I do real world work and try to recharge. I will leave you with one note of optimism, from Mark Perry. I went to college in the nadir (1980) of the American beer industry, where a small oligopoly of mediocre beer producers was protected by government legislation. It was a classic example of how regulation drives monopoly, consolidation, and loss of choice. 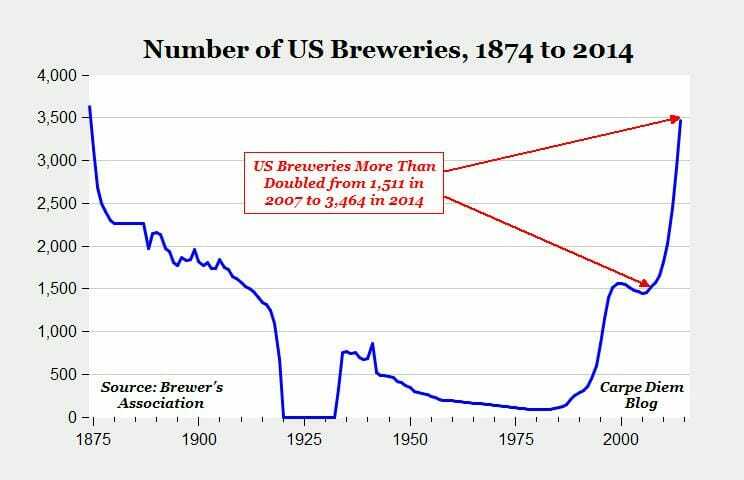 With deregulation, the American beer industry has exploded. Sounds like a good time to thank you for your blogging over the years. I first came to your blog for your articles on business, and stayed for your consistent voice of reason. I read a few blogs now, and I've read many over the years, but yours is the only one I've read since the beginning. Thanks! "With deregulation, the American beer industry has exploded." 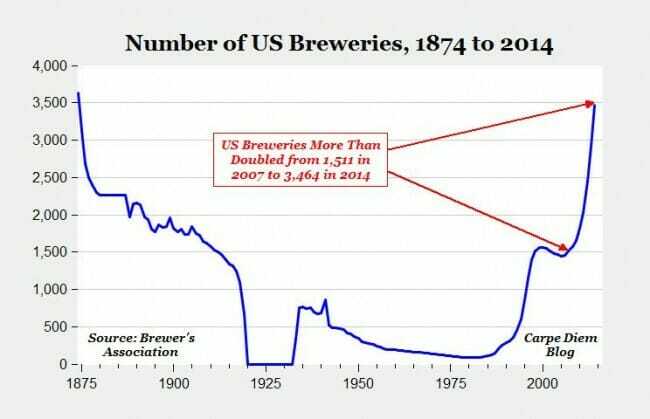 The spike in the number of breweries at the end of the graph largely corresponds to the rise in micro-breweries. More breweries does not necessarily mean more beer is being produced. A larger number of breweries making the same amount of beer as was made by fewer breweries before is not an explosion of the beer industry. I see that Xingu Black is a lager. Weyerbacher is a brewery in Easton, Pennsylvania that makes a great stout called Tiny you might like. http://www.weyerbacher.com/beers/year-round/tiny/ "This beer is very smooth and lacks the astringency you sometimes find in these Imperial Stouts." Hmm. Even if it was true that more isn't being produced which is unlikely, would you deprive us of the those great new beers? You can't put a price on that.
" Even if it was true that more isn't being produced which is unlikely"
I will agree, that it's unlikely that total beer production has increased at all, however it's even more unlikely that it has increased by anywhere near as much as the number of brewers. The numbers presented here do not prove that the beer industry has exploded. It's more likely that the beer industry is fracturing as regional and micro brews take market share away from the big national brewers (please note: I am not suggesting that this is necessarily or even likely a bad thing). "would you deprive us of the those great new beers?" 2. Not all of those new beers are great. I will however, concede that on average, regional and micro craft brews are of higher quality than the major national brands. However, the number of new breweries is far too high for them to all be successes, flops and failures are inevitable. "You can't put a price on that." What changed in the 1980s? I thought the three-tier system and most of the blue-laws are still in place. I had thought it was more about people waking up and figuring out they preferred variety and quality over cheap stuff in cans. Like the specialty coffee movement killed Folgers and got a kazillion specialty shops and roasters to pop up. "micro craft brews are of higher quality than the major national brands." If you mean better tasting, I agree with you. How can you judge the quality of a beer without inspecting the brewery and testing the beers? Major beers are brewed exactly the same so there's no deviation in taste. I like the variety so I don't buy the major beers. Apparently, Matthew Slyfield is correct. From the Wall Street Journal: "The number of liters of beer purchased per year has stayed the same and is expected to shrink slightly, according to data from research firm Euromonitor. Meanwhile the population has risen. That means people on average are consuming less beer and, if they’re consuming beer, it’s more and more likely to be craft." It's Carter's one truly great legacy. Trucking and oil pricing deregulation pale in comparison. Great Divide Claymore Scotch Ale or Oskar Blues Old Chubb for me. So good, so damn good. "More breweries does not necessarily mean more beer is being produced." Who cares? Greater choice and higher quality product in the industry it's own reward. (the movie) experience, with the same arguments circling over and over. emails asking me why I hate poor people." I've been following this excellent blog (but not so much its comment section) for years, regularly. The Coyote does not seem to participate in the discussions going on in the comments section, which may be why participants appear to him not responsive in ways preferred by him. More fundamentally, while the Coyote is among the most convincing libertarians I know, he does exhibit a certain faithfulness vis-à-vis a limited number of libertarian stereotypes. To break out of the circling route, maybe he should apply his wonderfully resourceful mind to questioning some of the habits and dogmas of libertarianism.